A team of physicists from Immanuel Kant Baltic State University have suggested a method to identify single antibiotic-resistant tuberculosis-causing bacteria. The new method detects the bacteria and evaluates their resistance to antibiotics without damaging the biological sample. The results of the first trial of the method were published in Data in Brief. Tuberculosis is a major cause of death globally. According to the World Health Organization, over 1.5 million people died of TB in 2017. Each year, the number of those infected with TB increases by 10 million. The disease caused by antibiotic-resistant strains of Mycobacterium tuberculosis is the most dangerous. The strains of the Beijing family (named after the city in which they were first observed) have also become resistant to many medicinal drugs. Methods of quick identification of drug-resistant bacteria are required both for clinical practice and scientific research. A team of researchers from Immanuel Kant Baltic Federal University and multi-institutional colleagues has suggested using Raman scattering spectrography to analyze bacterial cells. This non-invasive method identifies the composition and structure of the sample based on the scattering of laser radiation of a certain wavelength. The samples were provided by Saint-Petersburg State Research Institute of Phthisiopulmonology. The authors used bacterial strains obtained from lung expectorations of tuberculosis patients, as well as from bone tissue samples taken during surgical procedures. Before the experiments with Raman scattering spectrography, the level of drug resistance of the bacteria was determined using standard biological and chemical methods. 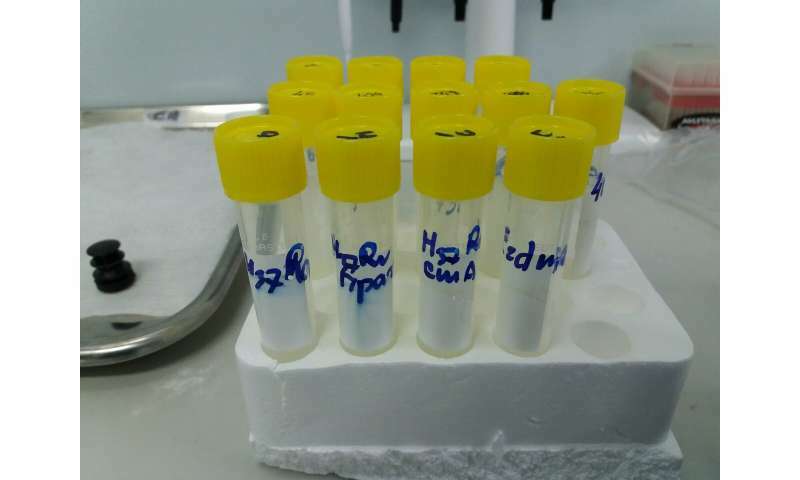 To obtain information about the structure of the cells belonging to different strains, the scientists subjected different bacteria strains to the spectroscopy procedure. Because resistance to antibiotics occurs due to changes in the composition of bacterial cell wall components, among other things, the cells of different strains appeared to scatter the light differently. Spectroscopy distinguished the differences in the cell walls of drug-resistant and drug-sensitive bacteria. The study published by the authors included images of bacterial cultures with different types of resistance to antibiotics and their characteristic Raman spectrums. The information on bacteria from lungs and bone tissue was provided separately. "The data we published contains information of spectrums typical for different strains of Mycobacterium tuberculosis. According to the results of the experiment, Raman spectroscopy may be a useful tool for determining the levels of drug resistance in tuberculosis agents," says Andrey Zyubin, a senior research associate at the Scientific and Educational Center Fundamental and Applied Photonics. Nanophotonics.